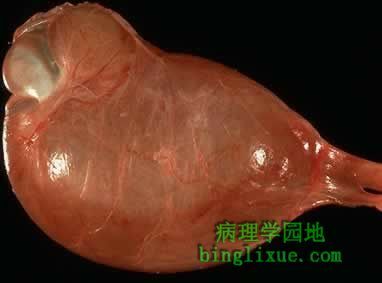 Here is a large hydrocele of the testis. Such hydroceles are fairly common. Clear fluid accumulates in a sac of tunica vaginalis lined by a serosa with a variety of inflammatory and neoplastic conditions. A hydrocele must be distinguished from a true testicular mass, and transillumination may help, because the hydrocele will transilluminate but a testicular mass will be opaque.